Thanks to our good friends over at the social media networks, individuals can create personal brands better than ever. Though you may not know it, your actions on social media accounts give the public a certain image of you. This is probably most true for those who are very fluent in social media—continually connecting and commenting with others on the web who enjoy similar websites and articles. However, a personal brand works just like anything else in life: having one can be very beneficial; not having one can be damaging, and vice versa. A good way to think about a personal brand is like a resume. In a sense, a resume is a document that explains why you are one way and not another—you’re good at math because you studied it in college; you’re a loyal employee because you stay at your jobs for over one year, etc. 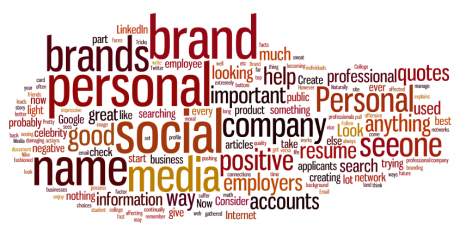 In other words, creating a personal brand through social media is becoming increasingly important for many professionals (and looks great on a resume). Why? 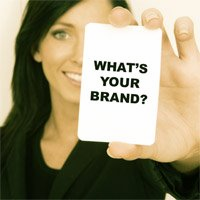 Personal brands are now very much a part of professional brands. Look up your name in quotes and out of quotes on the Internet. This will help you pull up anything you have ever said that was recorded. Look up your name and company together in one search. This will help you see how much information has been connected back to your company. Look up every social network you have an account. The best thing you can do is set these accounts to private and/or micromanage what is said on these accounts. If you have a few accounts that aren’t being used, delete them. Whether you find nothing or a lot of information through your searches, the time to start developing a personal brand is now. Pretty soon, employers will be looking to see that you have a positive brand, not looking to see that you don’t have a negative brand. Guest Blog—This is a great way to get your name out there in a positive light. As long as you don’t write anything offensive, your articles should jump to the top of Google when searching your name; thus pushing anything negative to the bottom. Personal Website—If you can show that you can manage your own personal website, and one that is positive, you will look impressive to future employers. Interaction and Social Media—Naturally, participating in social media will help give you a good name. If you have a lot of good, quality connections on LinkedIn and Twitter, then employers will be able to see that those well respected (or those with great personal brands) see you in a positive light. Resume and Business Cards—This is the old fashioned form of branding, but it is important nonetheless. Make sure you take every opportunity to further your career, and then put it on that resume as fast as you can! A professional business card will also help. Email Address—This is about the easiest way to improve your brand. Create an email address that includes your name and nothing else ([email protected] is probably not your best choices. The moral of the story: Personal brands affect professional/company brands. This makes a personal brand an important factor when trying to land a job or trying to launch a product. If you have a picture or comment you used on a social media site that you’re not proud of, don’t sweat it. Follow the few tips above and your positives will far outweigh your negatives. About the author: Amanda DiSilvestro is a writer on topics ranging from social media to employee background checks. She writes for an online resource that gives advice on topics including business phone systems to small businesses and entrepreneurs for the leading B2B Directory, Business.com.